If you are looking for a Chicago, IL Heating and Cooling Company, Look no further than Polar Heating & Air Conditioning. The HVAC experts at Polar know how to get the job done right and at an affordable price. We have proudly served Chicago, IL for many years and we would like the opportunity to earn your business. We offer complete HVAC Services including: Furnace Repair, furnace maintenance, furnace installation, air conditioner repair, air conditioner maintenance, air conditioner installation, boiler repair, boiler maintenance, boiler installation, water heaters, and Indoor air quality solutions. We also offer light commercial HVAC services in Chicago, IL as well. If you are looking for the best price on the best equipment, installed by the best, Polar Heating and Air Conditioning has you covered! At Polar Heating and Air Conditioning, we understand how frustrating it can be when your furnace doesn’t work. We also, know that choosing the right Chicago, IL heating and cooling company is a lot like playing Russian Roulette. While many Chicago HVAC companies are fine, there are those that play a little dirty. When you choose Polar, you can rest assured that your satisfaction is of the utmost important to us. We have literally thousands of satisfied customers in the area, and we can’t wait to serve you. Our Nate Certified Technicians can repair any make or model of furnace, air conditioner, or boiler. We offer a FREE 2nd opinion on all repairs for customers who already have a written estimate from a competing company. Homeowners and Business owners in Chicago can trust the experts at Polar Heating and Air Conditioning for affordable heating and cooling equipment installation. We offer guaranteed best pricing and FREE estimates on all new equipment installations. Have you already received a written estimate from another Chicago, IL heating and cooling company? If so, we will beat it by up to 5% on comparable equipment. We have over 60 years of experience and back all of our installations with the strongest warranty protection in the industry. Whether you are building a new home or replacing an existing HVAC equipment, you simply won’t find a better value than you will at Polar. Contact us today to save money on your new furnace, new air conditioner, or new boiler today! 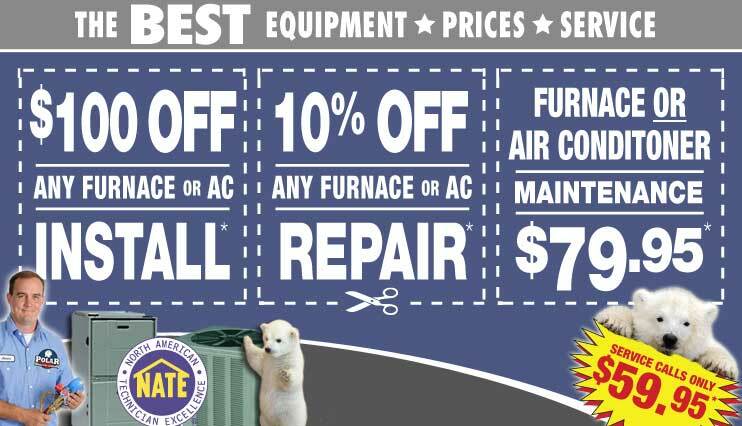 Did you know that annual maintenance on your heating and cooling equipment can actually save you money? It’s true! By performing air conditioner maintenance, boiler maintenance, and furnace maintenance, you save money through decreased operating costs, fewer repairs, and longer lasting equipment. When you do the math, spending a little money now, is an investment in future savings. Not only is annual HVAC maintenance important for your pocketbook, it can also me necessary to maintain warranty protection. If you purchased a new furnace, ac, or boiler, you will want to read your agreement to see if annual inspections are a requirement of your warranty. That being said, if you are looking for affordable and dependable cleaning and maintenance services for your equipment, you can expect the best from Polar Heating and Air Conditioning.